FINAL DECISION: Loved the couple was completely lukewarm about the plot of the book which seemed to have some pointless complications. Struggled through the first half and enjoyed the second. THE STORY: Emma Cadbury is having a second life as a surgeon after years of being the youngest madam in London and a prostitute before that. What she doesn’t need is the complication of Brandon Rohan. Emma met Brandon when he was recovering from serious war injuries and she urged him to live. Several years have passed and Brandon’s memories of those times have been clouded by his prior addiction to opium. When someone tries to murder Emma, Brandon is determined to protect Emma even if she wants to stay away from the man she knows is not for her. OPINION: This book was okay but a disappointment to my expectations. I read the prior book years ago and I had anticipated Emma and Brandon’s book so much. While I still loved Emma and Brandon together, I was greatly disappointed by the story in this book. The entire first half of the book was a slog to get through. There was not enough of Emma and Brandon’s relationship and a lot of stuff that was intended to complicate their relationship and ended up being annoying and abandoned by the end. There is the “other woman” story that went absolutely nowhere but was the primary reason that Emma and Brandon couldn’t get together quickly. The murder attempts didn’t work as well in the beginning as the setup. The second half of the book was much better. When the focus turns to just Emma and Brandon, the pace picked up, the intensity of the character’s relationship increased and I enjoyed reading the second half very much. So this is a book that ultimately ended up okay for me, but I didn’t enjoy the first half of the journey which seemed mostly pointless. WORTH MENTIONING: I liked the epilogue, but can’t help but wish that we actually got to see the events. 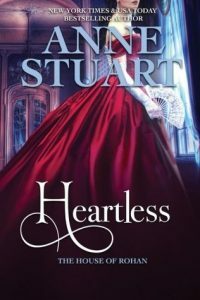 CONNECTED BOOKS: HEARTLESS is the fifth book in the House of Rohan series. While each book in this series is about a different couple, there are overlapping characters. Indeed, the story of this book began in the prior book in the series, SHAMELESS, and I think this book is better read after that book (even though the events are summarized here).